We understand there is too much stress in the lives of most people today. Balancing family, work, school and other constant pressures can be draining and sometimes exhausting. So why not treat yourself to a relaxing massage, facial or body wrap while you're on vacation. Costa Rica offers a different approach as the bio diverse land truly lends itself. 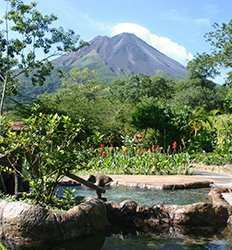 The minerals, volcanic muds and fruit extracts found throughout the region make the experience one of a kind. Our spa treatments will bring back your inner harmony and rejuvenate your body, mind and spirit. After climbing mountains, surfing, canyoning, rafting, zip lining, scuba diving or kayaking, pamper yourself to a natural invigorating massage. You can have treatments at poolside, at a spa pavilion, among a tropical garden or in the luxury of one of the villas or bedrooms. The decision is yours. Inspired by the essence of massage, these Spa treatment facilities will help you find the balance in your life. Our therapists are among the best in the world and will sooth your muscles from head to toe. You'll forget your even here. A massage or a couple of hours at the spa is the best way to finish the day and a great way to get ready for the nightlife. Below we have compiled a list of Health Spas' and services available to you in this region. All of the treatments provide exceptional guest service to our customers and sustainability for Costa Rica. While you are improving your health and relaxing, you are also contributing to the development of organic goods industry in this little town.